Selvella holiday farm is named after the messuage situated on a hill in front of the medieval village of Allerona, in the province of Terni. The dwelling extends for 50 hectares to the small valley of Selvella, from the edge of a natural reserve of Villalba to the national forest of Selva di Meana. The 800 stone farmhouse and hayloft have been restructured over the past years by the skilful hands of the Danielli family (owner of the property), whom day by day has renovated the estate while maintaining its original architectural elements. The atmosphere of the past are kept intact by the rustic and simple furnishings of both the interiors and the exteriors of the holiday farm. Each night, the guests of Selvella can enjoy an almost surreal experience by observing the sunset directly from inside their antiquely furnished rooms: the small, yet beautiful green valley and the woods turn into a magical forest covered by nothing but the sounds of nature. 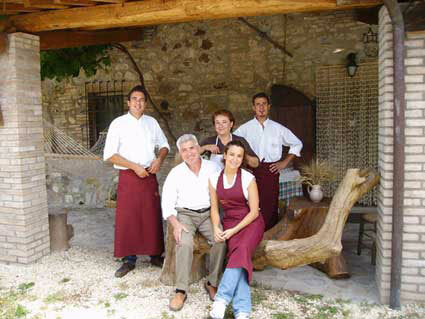 The barn that was converted by Ansano Danielli into a cozy dining room will fill your senses with the antiquated aromas and tastes of the traditional Umbrian recipes prepared from local products by Valeria Danielli.